Discontinued. The Intec 30c is a combi gas boiler with an output of 30kW. The Intec C is Alphas flagship combi boiler and it comes with lots of improved features that help deliver benefit to you. 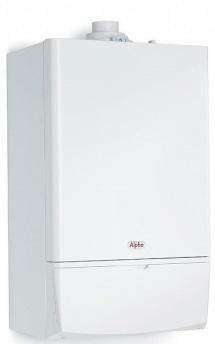 These boilers are available in two outputs, 30kW and 24kW. It’s also available with the options of having it as a natural gas boiler or an LPG boiler. It comes with a designed-in filling loop, seasonality valve, stainless steel heat exchanger valves and tails that are fitted already. The boiler also comes with many ways to help protect and keep itself running, including a clip-on DHW temperature sensor to help your boiler know when it needs to be on. A daily pump kick helps you when you may not need your boiler like those summer days. It also has a frost thermostat to help protect the boiler from the cold wintery days. It features detailed fault codes for the rare chance your boiler could go wrong, which you can then check against our online fault code guides to find a solution. This boiler comes with 7 years warranty. Discussed this combi with a gas engineer & his recommendation was impressive, "come along way over the years" he remarked. Thus I bought the product & he fitted it. A full 5 year warranty included, very efficient I must say.